Many of the major search engines offer tools to web marketers that will help you with enhancing your site to ensure its search presence. These tools can be very helpful when developing your site. 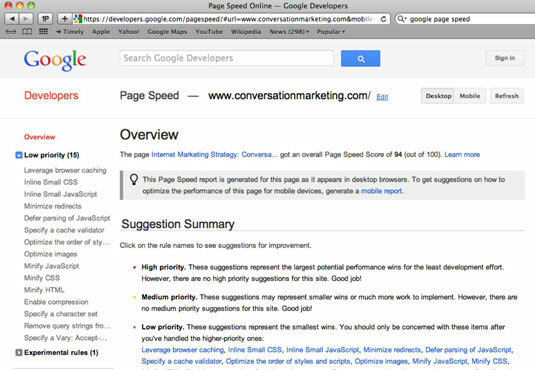 Google Page Speed lets you evaluate site performance. It then provides you with specific guidelines for giving your site a speed boost. You don’t have to install anything — Page Speed is available as a web tool. Go to Google Page Speed and enter your website URL. The resulting report prioritizes changes into high, medium, and low priority. Click any of those and you’ll get a specific list of changes you can make to speed up your site. If you see Optimize Images under medium or high priority, handle that first. It’s often the fastest and easiest way to give your page a speed boost. Yahoo! is no longer an independent search engine. Bing bought the company in 2010. Since then, Bing has shut down Yahoo! Site Explorer and folded Yahoo!’s data into its own webmaster tools. Set up an account with each search engine, as directed. Verify site ownership by either uploading an authentication file or adding a meta tag to your site, as directed by the search engine. If you have no idea what this step means, talk to your webmaster to get it set up. Diagnostics→HTML Suggestions tells you, at a glance, whether any pages on your site duplicate title or description meta tags, or whether they’re missing those tags. Diagnostics→Fetch as Googlebot gives you a peek at how Google sees individual pages on your site. Your site on the web→Links to your site tells you which pages on your site have links from other sites. And you can drill down to find out where those links come from. Your site on the web→Search queries allows you to peek at the key phrases (and your rankings for those phrases) that drive traffic. You can export these reports to TSV (Tabbed Separated Values) format if you’re a real datahead, too. Google Webmaster tools are a must have. Don’t leave them out of your toolbox! Crawl shows pages with crawl issues, redirection statistics, and total pages crawled/indexed by Bing and Yahoo!. Traffic shows you which terms drive visits to your site, how you ranked for them, and your click-through rate. Index Explorer is just dang nifty. With it, you can click through Bing’s actual index of your site. It’s a huge help for diagnosing crawl issues. And, yes, you can export all these reports to TSV (Tabbed Separated Values) format.